The second month of the year is February which is the smallest among the twelve months. This 28 day month is full of holidays and therefore you can plan a lot of outstation visits or a trip or a romantic date for your partner. Basically February has only 28 days but in a leap year it comprises of 29 days. The name February was originated after the Roman festival of Purification known as Februalia. According to the Hindu calendar, there are many vrats and festivals in this month. Few of them are listed here. Saturday, 2 Feb– according to the Hindu Calendar, on this day people keep Pradosh Vrat. Also it is the monthly Shivratri on this day. Sunday, 3 Feb– on this date is the chaturdashi and many people of Hindu religion keep fasts on this day. Monday, 4 Feb– it is the no moon day also called as amavasya in India. Since it is Monday, therefore people keep Somvar Vrat on this day. Tuesday, 5 Feb– there is Gupt Navratri on this day and the start of the Magh month of the Hindu calendar. Friday, 8 Feb– Ganesha Jayanti and Varad Chaturthi is celebrated on this day. Sunday, 10 Feb– Vasant Panchmi is celebrated on this day. It is a Hindu festival that remarks the coming of the spring season. It is usually celebrated in the Magh month of Hindu calendar which occurs in between January and February. Tuesday, 12 Feb– Rath Saptmi is going to occur on this day. Wednesday, 13 Feb– Kumbh Sankranti is going to be celebrated on this day. Also it is Bhimastmi and Durgastmi Vrat on this Day. Thursday, 14 Feb– on this day is Rohini Vrat. Saturday, 16 Feb– people keep Ekadashi Vrat on this day as it is the eleventh day after the no moon day. 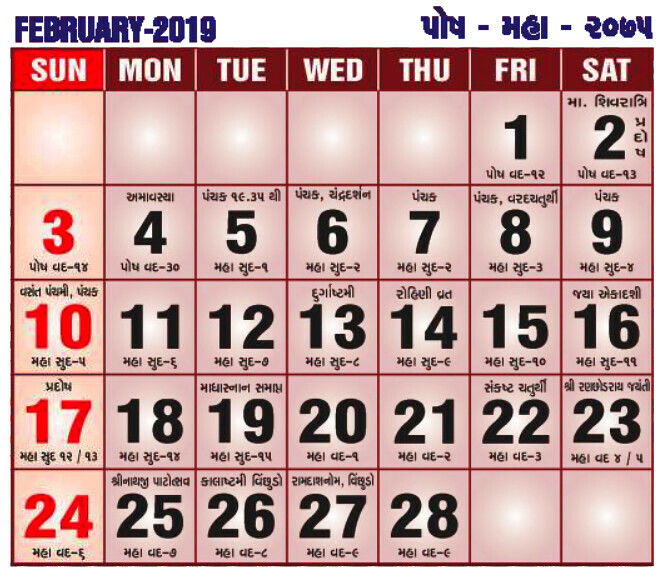 Sunday, 17 Feb– Pradosh Vrat is falling on this day. It is a Hindu Vrat for the worship of Lord Shiva and Parvati. It is always celebrated on the thirteenth day after the full moon day or the no moon day. Tuesday, 19 Feb– Shivaji Jayanti and Ravidas Jayanti both are going to fall on this day. Apart from these it is the full moon day called Poornima. Also Magh Snan is going to end on this day. Friday, 22 Feb– Sankashti Ganesha Chaturthi vrat is going to fall on this day and people often keep Chaturdashi Vrat. Tuesday, 26 Feb– on the eighth day after the full moon is the Ashtami and this day is going to known as Kalashtmi. Wednesday, 27 Feb– Shri Sant Ravidas Navami is going to fall on this day. Thursday, 28 Feb- it’s the National Science day on this day. Science day is celebrated every year to mark the discovery of the Raman Effect which was invented by the Indian Scientist Dr. C V Raman on 28 Feb 1928. He was awarded the Noble Prize in 1930 for the same. Also Swami Dayananda Saraswati Jayanti is going to occur on this day.